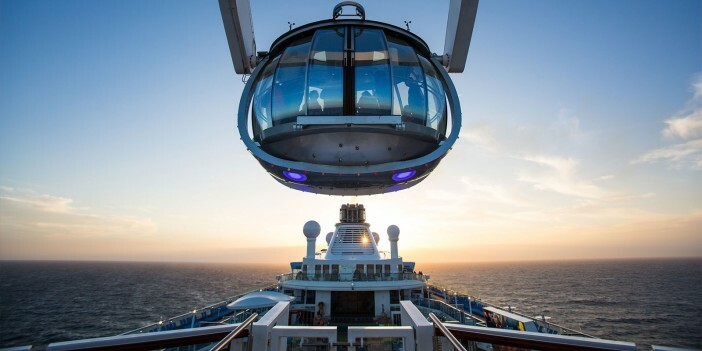 Royal Caribbean’s cruise ships are packed full of fantastic activities and venues. However for passengers that want to take their at-sea experience to a whole other level the line offers exclusive membership to the coveted Crown and Anchor Society. After joining the society you’ll receive members only invites to a selection of special events and VIP parties. Here passengers will enjoy complimentary drinks, insider news and the opportunity to ask representatives burning questions. It’s the line’s way of saying ‘thank you’ to its most valued cruisers and repeat customers! Want to know more? Read on for a complete overview covering everything you need to know about the cruise industry’s most sought after society! What does down at the VIP events? As you enter the Crown and Anchor Society venue you’ll be personally greeted by the ship’s officers. Kick things off with cocktails and snacks on the house while you socialise with other Crown and Anchor Society guests. After mingling passengers are invited to sit down to a special address from company representatives, managers, crew members, ambassadors and even the Captain himself. Speakers will vary from ship to ship however you can rest assured that they’ll always be captivating, engaging and interesting! How do passengers score an invite? Understandably to score an invite to a Crown and Anchor Society event you’ll have to be a member. Invitations will be hand delivered to your stateroom while next generation Oasis and Quantum class passengers will be able to read invites via their flat screen message inboxes. How many events are thrown on each cruise? Royal Caribbean will usually throw a handful of parties on each cruise, with invitations depending on your Crown and Anchor Society tier level. There is usually a general event open to all members as well as a selection of smaller parties for higher class passengers with Platinum or above membership. First and foremost, who could say no to an evening of complimentary cocktails, canapés and fantastic company? Secondly, it’s a great opportunity to socialise with your fellow passengers and get to know people who love cruising as much as you do. Speeches offer fascinating insight into the ins and outs of Royal Caribbean operations while the chance to chat to important crew members, executives and the ship Captain is a thrill in itself! Want to make the most of your Crown and Anchor Society membership? Cruise 1st runs year round deals on a huge selection of Royal Caribbean itineraries that will help you score invitations to Crown and Anchor Society events and fast-track your way to Platinum status and beyond. Happy sailing!